The oil fraction is one of the key parameters in the design of horizontal pipes and relevant equipment in the oil production and transportation process of the petrochemical industry. Several existing models and correlations were applied as the predictive method, but due to the empirical nature of the models and correlations and limited data used for the benchmarking process, the applicability of the existing models and correlations to all flow regimes and full oil fraction range has not been well-examined. In view of these issues, this study is aiming at developing a predictive model of oil fraction in horizontal oil–water two-phase flow applicable to all flow regimes as well as full oil fraction range. In the modeling process, the oil–water two-phase flow is geometrically modeled as the stratified flow with dispersed water-continuous oil flow in the upper part of the circular channel and dispersed oil-continuous water flow in the lower part of the circular channel. 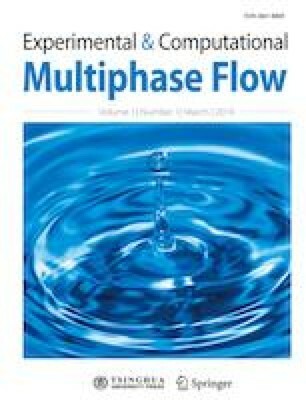 An analytical model for predicting oil fraction in horizontal oil–water two-phase flows has been derived based on the assumption of velocity heads of two phases being equal. The analytical model includes two entrainment factors, e1 and e2, and the values of e1 and e2 are determined to be 0.2 considering bi-lateral droplet entrainments to oil and water phases. The analytical model has been validated with existing experimental data taken in a variety of test conditions. The comparison results demonstrate that the predictive capability of the analytical model is reasonably good for most of the existing test database including all six distinct oil–water two-phase flow regimes with the mean absolute error (or bias), standard deviation (random error), mean relative deviation, and mean absolute relative deviation of 0.0116, 0.0422, 1.61%, and 8.50%, respectively. Additionally, it is confirmed that the applicability of the analytical model can be ex tended to the steam–water two-phase flow in horizontal channels.